There are many things in life which seem frivolous and this is certainly one of them. Chef Peter bought these from Daiso at Aberdeen Centre for everyone at Ganache. I think that I was the most excited about making cakes out of paper oddly enough. 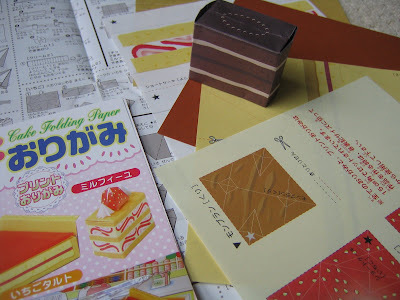 Despite only having Japanese instructions alongside small schematic diagrams, I did manage to figure out how to construct all five cakes and one pair of tongs. All were carefully folded in the evenings while watching American Idol. 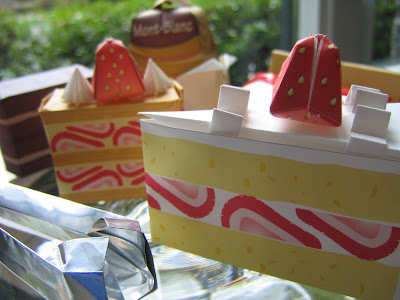 My favorite is the rectangular cake with the whip cream rosettes and strawberry on top, but they are all so absurd in their own ways. Meanwhile, I have been constructing a real cake as well, a Black Forest entremet for Eric's birthday which is coming up this Friday. Details to come! Posted by Charmaine at 10:22 p.m. I forwarded this to Joseph. He was on the front page of the Sun the other day! March 31, 2007 at 12:14 a.m.